Oil markets are trading steady this morning after another set of large gains yesterday. Yesterday, the API’s inventory report helped propel crude oil higher by more than $1.20 (2.1%), well surpassing $61/bbl. This morning, markets have found less exuberance, trading flat with just an 8-cent price increase, putting crude prices at $61.71. Refined fuel both rose yesterday and fell today, though gasoline saw larger gains than diesel. Gasoline tracked crude oil’s gains with a 3.7 cents (2.1%) price increase, while diesel gained just 2.8 cents (1.4%). Today, diesel is leading the oil complex lower, with losses of 1.3 cents (-0.6%) today and a current price of $2.0747. Gasoline has not been immune from losses, and is down 1 cent (-0.5%) to $1.7874. The API released their weekly data a day late yesterday, following the New Year holiday. 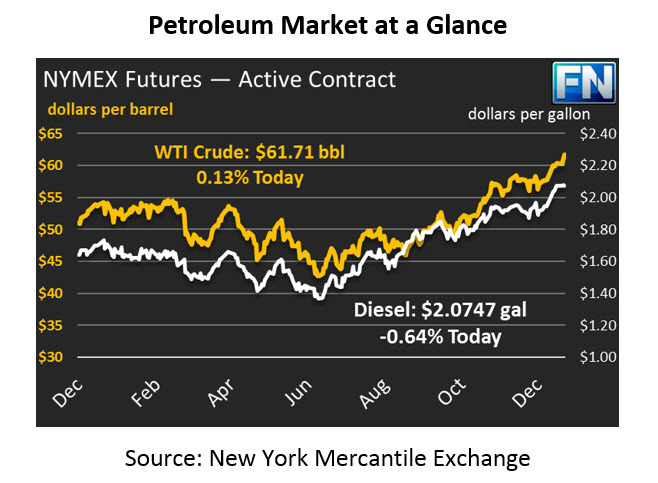 The data showed crude draws in line with market expectations, accompanied by a regular gasoline build. Diesel stood out, though – after very small builds last week, diesel added 4.3 million barrels to national inventories this week. The large build helped to keep diesel price increases tempered even while crude saw large gains. In the continuing Iran instability, the Revolutionary Guard has been deployed in some regions to counter protests. There are no signs of an end to the protests yet, but there also has not been any significant escalation to impact oil flows. Markets will continue watching the situation, and until the protests calm down (or, less likely, the regime topples), oil prices will continue to trade at a premium. Cold weather along the East Coast is beginning to affect more than just fleet operations. Yesterday, Phillips 66 announced that portions of its Wood River refinery in Illinois would be shutting down due to weather, with no timeline given for restart. As we noted earlier this week, extreme cold weather has already disrupted fleet operations and made winter fuel preparation a necessity. Make sure your fleet is protected.